Baroness Kennedy came from a working class background in Glasgow. She was called to the Bar in 1972, and has become one of the United Kingdom’s most distinguished criminal lawyers. In her vibrant career she has worked on a number of the leading cases, including the Guildford Four Appeal, and the transatlantic bomb plot. She has also been a leading voice for equal opportunities in the legal profession for women. Baroness Kennedy has championed law reform in relation to women regarding sexual and domestic violence, developing the defences relating to battered women’s syndrome in the British courts. She has chaired numerous inquiries, and has chaired the British Council and the UK Human Genetics Commission. She has authored a number of books on law reform and is a well-known broadcaster on law and ethics. She has been a member of the House of Lords as a Labour Peer for 18 years, where she sat on the Joint Committee of Human Rights, and is now chair of the European Union Sub Committee. She is chair of Justice and co-chair of the International Bar Association’s Institute of Human Rights. She is Principal of Mansfield College, Oxford, and an Honorary Fellow of the British Academy. 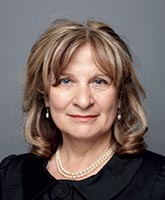 Baroness Helena Kennedy is an inspiration to generations of lawyers with her commitment to criminal justice, social justice and women’s rights. She does her work with the conviction and determination that justice will prevail in society. Nominated by Claire Bradford, Year 3 LLB and chosen for the Inspired by Law gallery of lawyers and legal campaigners in 2015. Photo kindly provided by Baroness Helena Kennedy QC. Copyright Alistair Thorpe.